This post brings us through the end of June. Even though meteor rates are relatively low and the nights are short, June is a good time to observe in Tucson thanks to the lack of clouds and dry air. By the first week of July (perhaps as early as today 7/2) the monsoon kicks in and clouds, t-storms and high humidity rule the nights. We are also starting to see the start of some of the showers that make July so interesting. The Alpha Capricornids (CAP) are the first to start. 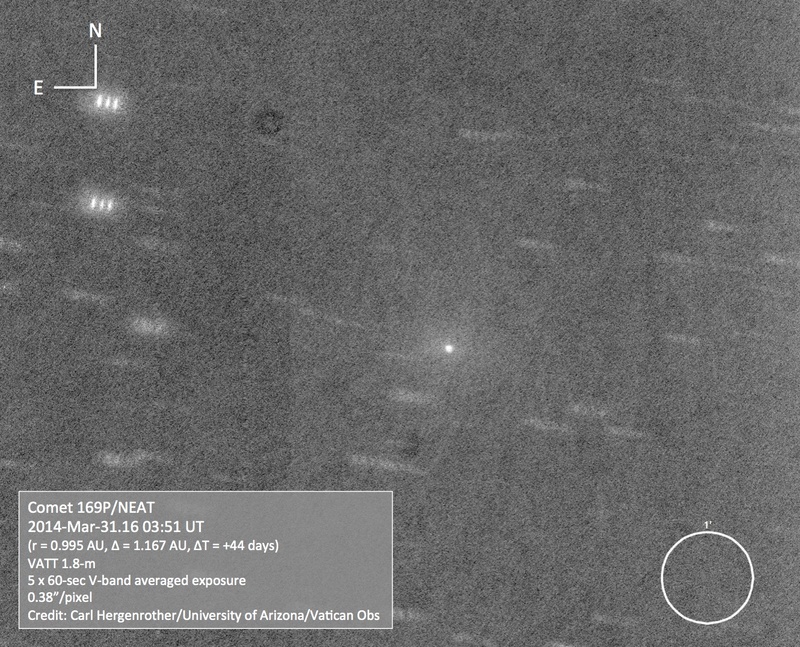 This shower is produced by the weakly active comet 169P/NEAT (the image below is from the Vatican VATT 1.8-m taken earlier this year after 169P’s most recent perihelion passage). This comet has a similar orbit to two other comets, 141P/Machholz and P/2003 T12 (SOHO), suggesting that all three are pieces of a larger comet. In fact, when 141P was discovered in 1994 it was in the process of splitting. A cascading series of splitting seems to be a common process for comets and might even be an end-state for many of them. Was in Traverse City, MI on July 16th and saw a bright red light in the north sky moving west to east. I initially thought it might be a plane light; attributing the varying intensity to cloud cover. However, I soon realized that it was not a plane light. It gradually faded out; but immediately following we saw several “normal” shooting stars traveling in a more vertical path that lasted a good 4-5 seconds. Can you attribute what I encountered to anything in particular? I’m not sure what you saw. There weren’t any bright fireballs reported for your area at that time (doesn’t mean one didn’t happen, just that it wasn’t reported). I was just about to tell you to report your sighting to the AMS Fireball folks but I see that you already have (its under pending reports). Based on your description is may have been a slow (low relative velocity) moving asteroidal meteor. Since they are rocky meteoroids originally from asteroids rather than comets, they can last for 10s of seconds. I’ve seen a few and they come in all different colors and have a habit of fluctuating in brightness.